The controversy over Qatar’s selection as host for the Fifa World Cup has not deterred the Gulf state from its preparations for the event. While it is reported that some contractors have spoken of cancelled or delayed projects, none of these have anything to do with the major ones of the soccer extravaganza. A source at a construction company referred to the delayed or uncertain undertakings as “vanity projects” while some have spoken of contract problems and bureaucracy. Unlike recent hosts of high-profile international sports events, Qatar does not really have to watch its dollars. The richest state in the world is in a hurry to catch up, lining up high-investment projects that will dramatically transform its urban and industrial scenario and its perception in the world’s eyes. It was reported that Qatar’s infrastructure spending over the next decade, including that for the World Cup, would reach about $150 billion with projects such as the $50 billion Lusail City scheme, $20 billion road network, $40 billion railway development, $4 billion stadium construction programme and $8 billion deep water seaport. According to BMI Research, Qatar’s construction sector will witness over the next 10 years an average annual real growth of 10.2 per cent, getting to 11.4 per cent between now and 2022. BMI also said low oil prices were a “minimal risk” to Qatar, which is among the 10 top oil producers, and it did not expect government spending or consumer confidence to be impacted over the coming quarters. Based on BMI’s research, fears reportedly voiced by some contractors are pointless or at best exaggerated. A banking stalwart who concurs with BMI’s projections is Dr R Seetharaman, CEO of Doha Bank, He told a meeting in India that Qatar’s consrtruction sector was expected to witness double-digit growth this year and support non-hydrocarbon diversification. He also highlighted that project biddings for 2015 would go past $31 billion and major sectors to witness activity would be construction and transport. Qatar National Bank highlighted the building boom and an expansion of the economy by 4 per cent at the end of Q1. It said the largest contributors to non-hydrocarbon growth were construction, financial services and manufacturing. Any construction activity calls for the sourcing and availability of building materials. Qatari businesses are conscious of this vital need and are making sure there will be adequate supplies to feed the boom, particularly when it gets hectic in the run up to the soccer World Cup. Ashghal, Qatar’s public works authority, signed a framework agreement with Qatar Primary Materials Company (QPMC) for the import of raw materials. The agreement assures Ashghal it will have the supplies it needs for its infrastructure development projects over a five-year period. Also assuring to Qatar consumers is the move by QPMC to sign up with Belgian engineering consultant, Rent-A-Port, for starting mining operations in the Khatmat Malaha area of Oman. So vital is the issue of building materials availability that Qatar-based Al Hodaifi Rocks, safeguarding against disappointments, signed an agreement with Oryx Industries of the UAE, a major producer of construction materials. Oryx Industries will supply Al Hodaifi Rocks with 2.6 million tonnes of quarry products over a one-year period through Fujairah Port. Qatar was said to be the world’s second-largest importer of gabbro products in 2013 and accounts for almost 90 per cent of the UAE’s gabbro exports. Saoud Ghandour, managing director of Al Hodaifi Rocks, referred to the current strong pipeline of construction projects in Qatar as justification for the deal with Oryx Industries. Under this agreement, QPMC will provide Ashghal with 41 million tonnes of limestone and 51 million tonnes of gabbro aggregates in order to continue and complete its construction projects in Qatar. The agreement extends across a five-year period. QPMC has guaranteed that prices of raw materials will be fixed in the local market and adequate quantities will be available for the first few years. Keen to have its utilities in order, Qatar awarded a contract to Germany’s Siemens for the turnkey construction of three substations. A separate contract was awarded to provide air-insulated switchgear. “Efficient and reliable power transmission is fundamental to a sustainable, environmentally sympathetic energy system,” Fatih Sakiz, CEO of Siemens in Qatar, said. The Swiss firm ABB also clinched a deal to supply three turnkey substations to feed the grid. 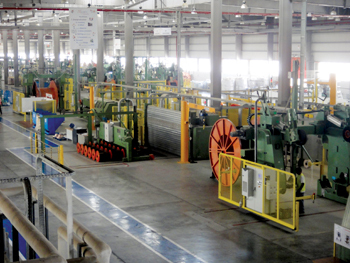 While much is said about Qatar’s infrastructure and construction sector advances, the country has made significant progress in the manufacturing sector. 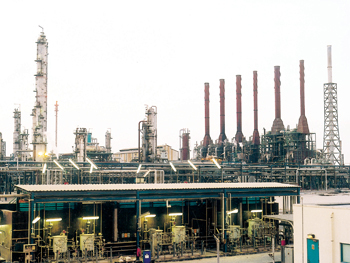 Qatar Petrochemical Company (Qapco) has completed in the last couple of years major expansions including ones for high density polyethylene and linear low density polyethylene. The fertiliser firm Qafco has also expanded. On the metals side, Qatar Steel is a major player in its field with a stake in Bahrain Steel among other enterprises. Qatalum is making a sound contribution to the Gulf’s total aluminium primary production. Since it began production in 2010, its production has toucned 640,000 tonnes, some 9.4 per cent higher than the installed capacity of 585,000 tonnes. Hand in hand with infrastructure development and expansions in Qatar’s manufacturing industries is the progress made by the logistics sector. Gulf Warehousing Company, the country’s leading logistics services provider, has embarked on the fifth phase of its Qatar Logistics Village where the aspiration is to offer 1 million sq m of space for companies to set up their warehousing activities. The cargo services provider DHL Express opened its fourth in-mall service point in City Centre Mall, bringing the number of such facilities to 11. It was stated that DHL, present in the country for 35 years, has had its revenues doubling over the past five years. An agreement that GWC signed with UPS allows the Qatari firm to provide UPS products and services, including express parcel delivery, as well as access to the UPS global network serving over 220 countries and territories worldwide. The Koreans also see investment opportunities in the pharmaceuticals and the recycling businesses.